Dogs love plush toys that are as cuddly as they are chewable. 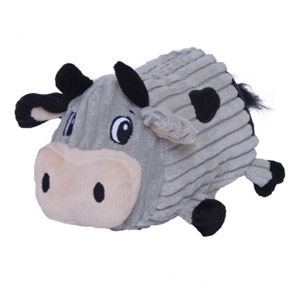 Outward Hound Fattiez have the perfect round shape that dogs can cozy up with and squeak with all day long. Outward Hound Fattiez dog toys are built to squeak to their own silly sounds. The Fattiez Cow makes a unique grunting sound mimicking a cow! Don’t be fooled by these cute animals, Outward Hound Fattiez are as durable as they are cute and are made with minimal seams for a more round, yet tough molar shape.